How or why did the M/S 'Estonia' sink 1994? If any ship loads too much weight, e.g. water, in its superstructure (or garage) above waterline for any reason, it will first heel and then suddenly capsize and float upside down on its intact underwater hull full of compressed air as shown right. Same applies to an anchor handling tug being pulled upside down. The ship cannot sink as it has not lost any hull buoyancy and would float as shown right. All the buoyancy, mostly now compressed air, remains inside the upside down hull and more buoyancy is added by the submerged deckhouse as explained here! The Swedish government decided 2005 that the ferry M/S 'Estonia' sinking after capsize1994 should be explained by scientists (sic) based on the official 'facts' of the JAIC, i.e. that water was loaded in the superstructure while the hull was intact. It is common knowledge that all these 'facts' were in fact lies, so it was very interesting to see how the scientists proceeded. The project was directed by Swedish innovation authority Vinnova and Mr. John Graffman. Mr Graffman was a naval architect and ex Swedish Navy, i.e. was working for the Swedish Navy when the 'Estonia' sank 1994. Mr Graffman was also a friend of Mr Hans Wermelin that was the first expert (?) to announce, before anybody else, that the 'Estonia' sank due to a lost bow visor and water loaded in the superstructure. There is no evidence that the bow visor was actually lost, i.e. fell off the M/S 'Estonia' or that 1000's of tons of water was loaded in the superstructure; it is cleverly planted disinformation on part of the Swedish authorities as described on other pages of this web site. It is quite disturbing that the man in charge, John Graffman, of the latest 'M/S Estonia' sinking explanation project 2007 was a friend of the person, Hans Wermelin, that spread the false rumor about the visor 1994 ... but Stockholm is a very small place. The Estonia conspiracy cannot end. In January 2006 Vinnova/Graffman decided that SSPA Sweden AB - Strathclyde University, Glasgow, Scotland - MARIN, Delft, Holland should carry out the study under the lead of SSPA at a cost of SEK 8 million! "The loss of MV Estonia has unraveled inherent weaknesses of ships with large undivided spaces (in the superstructure and deckhouse!!) when subject to hull damage ... !" (This is a strange observation - the MV Estonia hull was divided into 14 watertight compartments and was undamaged and there was no damage of the superstructure except that the bow ramp was allegedly open permitting water to enter there). "The official JAIC report with its supplements, the SPF study as well as all other available material pertinent to the ship and the accident, will form the basis for the detailed scrutinizing and reviewing study. Classification of the information, qualification of its pertinence, validation and ultimate synthesis will follow specialists' expert reasoning process." "The final report will summarize and detail the approach, methodology, tools and results of the investigation. ... One month after the project commencement, i.e. February 2006, a public call will be made for any professional opinion, analyses or other evidence to be made available in writing to the consortium. This information will be scrutinized in WP2 along with any other evidence available in archives. If deemed necessary by this consortium, further dialog will be initiated with the contributing parties. This step intends to ensure that transparency of the investigation is maintained and no scope for speculation exists (sic). Furthermore, a dialogue with the Industrial Panel of Experts, IPE, will take place during the whole project." "An internet web site will be developed where public communication will be facilitated and the final report will be made available in an electronic format. Three months after the project end, a special international symposium/workshop in Sweden on the project results will be organized, to facilitate public discussion on the findings." The results of the study 2006 were to be reported 15 September 2006, 15 March and 17 September 2007 and 15 March 2008 with a complete final presentation on 17 September 2008. No public call for any professional opinion, analyses or other evidence was made June 2006! A back-dated (1 April) call was published on a web site in July 2006 after the writer had asked where it could be found. The Joint Accident Investigation Commission, JAIC, of the MV Estonia sinking alleged 1994 -1997 that the front of the superstructure of the ferry several meters above waterline hit big waves and so the bow visor was ripped off; the visor then pulled open the interior ramp and nobody aboard noticed these noisy events! Anybody who has been to sea on a ferry in severe weather knows of course that, when a ferry slams its bow into a wave causing an impact, this event is heard all over the ship as a big bang - as you fire a canon - followed by vibrations. There is no way that you can continue at given speed and course, because if you do, there will be a second, noisy impact and vibrations! So you must slow down, change course ... take action, which is standard practice. Evidently the vessel bow/visor is designed to withstand the wave impacts, but the noise and vibrations are infernal and cannot be ignored. In falsified model tests JAIC/SSPA later showed that the noisy impacts occurred almost every minute with an upward and aft force of the order 300-700 tons. The first lie of the JAIC is that nobody heard or felt any impacts, and if they did, no action was taken. Actually there were no wave impacts at all and only one or two big bangs ... and soon after the ship got suddenly >30° list ... but the ship was stable and the list was reduced to <15° ... people could evacuate to open decks during about 10 minutes! The second lie of the JAIC was then that there was sudden capsize (big list, sudden loss of stability and floating upside down) as stated by the JAIC that you would have expected with a certain amount of water loaded inside the superstructure on the car deck 2.5 m above waterline (1 900 tons in the case of the Estonia). There is no evidence that the visor was lost or the ramp was pulled open at this time! There are many indications on the other hand that the visor was removed from the wreck under water after the accident with the knowledge of the JAIC! The three surviving witnesses of the ramp after the sudden list all say that it was CLOSED. The third lie of the JAIC was then that the visor was actually lost and the ramp was pulled open and that these events contributed to the accident! The Commission suggested that they filmed the wreck and that the visor had disappeared and was found three weeks later a mile west of the wreck. These are clever lies based on edited films and false facts without any evidence! The visor was simply removed from the wreck under water after the accident by Swedish Navy forces to support the first lie! There is no evidence that the visor was found or salvaged a mile west of the wreck! The fourth lie of the JAIC was then that a ferry sinks, when water enters into the superstructure through an open ramp (door) 2.5 m above waterline and floods a watertight car deck. Evidently water enters, if the opening is under water, e.g. due to ship pitching, BUT as soon as the ship stops and thge opening is above water, all the water simply flows out again! According JAIC the ship stopped after a few minutes with opening away from the waves and above water and more water flowed in! Confusing, isn't it? The fifth lie of the JAIC was thus that the water did not flow out! On the contrary - more water flowed up and in through the opening above water and on the side of the ship and caused the vessel to list. It is correct that a weight in the side lists a ship, but the JAIC conveniently forgot that this (weight) water would have trimmed the vessel and flowed out immediately when the ship stopped and pitched and trimmed on the bow. It was quite easy for the JAIC to get away with all these lies - they bribed some experts to support them and threatened other experts to shut up, including the writer. Media just reported what they were told by the officials! And as the JAIC got away with the above five outrageous lies, they decided that they could lie as the liked. All essential facts in the JAIC Final report are simple lies. No evidence at all is presented! The sad thing is that at least one of these 'experts' is now in the SSPA team! And SSPA falsified everything 2008. I understand that you are now very busy with subject at Swedish tax payers' expense, which please confirm. The MV Estonia was doing 15 knots heading into 4.2 meters waves with a large relative motion forward. The MV Estonia superstructure bow flare was struck several times by heavy 350-700-1000 tons wave impacts that nobody heard (no action taken on the bridge, eg slow down). Then various steel structure parts in the MV Estonia superstructure were damaged 10 meters forward of the bridge during at least 10-20 minutes: the visor side (deck 3) and bottom locks (main deck) were ripped off due to wave impacts, the visor moved up-down and damaged its bottom and the ship's main deck due to waves and relative motion, the visor lifting arms were ripped apart at the deck hinges on deck 4 due to wave impacts, the lifting hydraulic foundations were also ripped apart (deck 3) due to wave impacts, the hydraulic pistons and lugs then cut the deck 4 steel plate and a strong deck steel beam web and flange and the visor started to hit against the ramp protecting the superstructure, all ramp hooks and locks were ripped apart, etc. You are kindly recommended to verify the damages and ask yourselves how they could develop without being noticed by anybody - except as noise from the bow. Then the visor fell off (time is 01.15 hrs) and the ramp was fully open - the ramp top was then below the waterline and the forward speed was 14-15 knots. Water could enter into the superstructure 2.5 meters above waterline, when the MV Estonia with forward speed pitched the ramp opening below the waves. There is no evidence for this - three crewmembers in the ECR saw the ramp closed at 01.17 hrs, but assume that they are lying (they had of course escaped from the ECR at that time - http://heiwaco.tripod.com/epunk148.htm - after having started the bilge pumps as they were standing in water to their knees in the engine room). So water started to be loaded on the MV Estonia superstructure car deck (deck 2) and the water ended up inside on starboard side and suddenly listed the vessel. Then the MV Estonia turned 180° port and stopped with the opening away from the waves. There was no capsize (GZ<0, vessel floating upside down) that you would expect with 1 900 tonnes of water in the superstructure side (considering also trim, of course) so less than 1900 tons of water were loaded. You would now expect much water in the superstructure to flow out again through the opening in the bow and the vessel to upright. Evidently no more water could enter through the bow opening at this time as it was high above the waterline! Do you agree? If you agree, you must conclude that there are some basic errors in the JAIC analysis and evidence of the MV Estonia accident that you shall base your research study on. Then the MV Estonia started to sink - and maybe you will just concentrate on that in your study? The time is 01.20 hrs and the ferry is more than a mile from the position of sinking after 01.54 hrs. So the MV Estonia was drifting at >2 knots speed while sinking. Do you believe that? See http://heiwaco.tripod.com/epunkt19.htm . Anyway - the MV Estonia was sinking. The hull below deck 2 is undamaged all the time. All watertight doors are closed at 01.20 hrs. Most water in the superstructure should now flow out through the bow opening (easy to verify by model tests) and only a little water should remain due to the original stern trim, and this water should flow out through the scuppers. There is no way that more water can enter the superstructure at this time with the bow in lee and speed away from the waves and you should expect the MV Estonia to upright due to the buoyancy of the hull. But in order for MV Estonia to sink you must now flood at least three, four or five watertight and undamaged hull compartments after which the bulkhead deck comes under water and all the other compartments fill up. How could it take place? I will tell you. Primo - start to verify the model in calm weather and closed ramp with 0.5 meter stern trim as per MV Estonia original loading condition at zero speed. Car deck is full of trucks and cars. This is fun! Load water on deck 2 (car deck) just by filling the compartment with a hose from above and observe what happens (the ramp is closed); vessel lists and trims more on stern, with 1900 tons of extra water on the car deck (among all the trucks and cars) model turns upside down. Capsize. Evidently the vessel does not float on the deck house decks 4-9 (doors are open aft on deck 4, 5 and 6 and in the side of deck 7, the windows are broken when coming below water) that is flooded completely immediately. Secondo - verify the model in calm weather and open ramp and zero speed. Load water on deck 2 with a hose and observe again what happens; vessel lists and trims again on stern and capsizes with 1900 tons of water on the car deck. The bow was high over water all times. Same result as first test. Tertio - repeat the second test in heavy weather, open ramp with opening away from the waves, zero speed (the condition at 01.20 hrs); fill the superstructure with a hose but due to vessel pitching (>trim), you will find that the water flows and sloshes forward and back on the car deck and out through the bow opening in spite of original stern trim. Interesting! The sloshing is in reality very noisy. Recommendation - when you visit a ferry in heavy weather to check the bow impacts, also put 50 tons of water on the car deck and listen to it sloshing around. Fourth - open ramp down below waterline, forward speed 14 knots into 4.2 m irregular waves, big relative motion forward (no change of heading during test); after 10-20 pitching movements (1-2 minutes) up/down vessel stops and capsizes quickly. Fifth - like four but with a 180° change of course prior to capsize; vessel lists but after change of heading we are back to test 3 - and the water flows out through the bow opening due to the pitching. Six - repeat two but prevent the vessel from capsizing (cheating a little by using an outside support) and allow the model to trim on stern only due to the water in the superstructure until the first opening on deck 4 (apart from the bow ramp deck 2-4) comes below water. What opening is first underwater? Right - the aft vents on deck 4 into the superstructure below. You do not have to fill the superstructure anymore by hose - it fills itself. Release the support and see what happens! Capsize of course! All the water in the superstructure flows to the starboard side again and model turns upside down. Seven - ask yourself how the clock on the bridge, starboard side deck 9, could stop at 01.36 hrs. Did it stop when it came under water? But the vessel didn't sink until 01.54! Eight - like five but no water flows out through the bow opening for some reason at 01.20 hrs, no capsize takes place and the hull compartments are being flooded one way or another (you shall describe that) and the deck house decks 4-9 comes under water. The vessel is drifting at >2 knots for 35 minutes while sinking. How? How can a sinking ferry drift so fast? Please keep me informed of your progress of your study. Actually - the scientists will not do the above model tests! Instead they (task 3.2) will only run a special model with forward speed into irregular seas with an open ramp to see how much water enters into the superstructure. This water is collected in a tank inside the model to be measured after each test. That is all! The 'Bow water ingress ..." test results will then be used in 'simulations' of the sinking. No tests will be done at zero speed with the opening away from the waves to demonstrate that the water flows out by itself. The SSPA model tests and study are extremely limited in scope to avoid revealing the Truth: That the water flows out by itself as soon as the vessel stops and never sinks will never be admitted by the SSPA scientists (September 2006) because their job is to show that it sinks. Not that it does not sink! Prove me wrong! (In February 2007 the SSPA tested the above model and noticed that at least four times more water than suggested by the JAIC entered into the model! The model collection tank thus has to be re-arranged for final tests to be carried out later 2007! SSPA may also just fit a real deck behind the ramp opening - in lieu of a collection tank - and see what happens as suggested by Heiwa Co). (In March 2007 the SSPA tested the model almost as requested by Heiwa Co. The model listed 25° within one minute and reached a stable condition with 46-47° heel after three, four minutes! An incorrect model was used. A correct model would have capsized already at 33-37° heel). 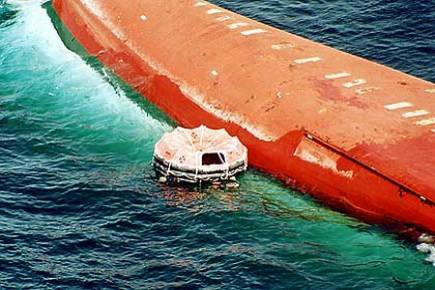 Of the two main scenarios (slide 23) the first one (lost bow visor and water loaded in the Car deck superstructure) is not possible as the vessel capsizes and floats upside down, when 1 600-2 000 tons of water is loaded on the Car Deck causing a heel of 33-37°, when GZ<0 assuming correctly that the deck house is not buoyant. The Consortium is (again) strongly recommended to verify the GZ righting lever curves with various amounts of water loaded on the Car deck. Therefore, only the second scenario is likely, i.e. underwater hull leakage that will be explained below. Underwater hull leakage - several compartments flooded abt 1 m - will cause an initial heel of maximum 12-18°; further heel is evidently prevented, if the Car Deck superstructure space is weather tight. Slide 26 is misleading in many ways; a volume is not defined as tons, etc. It should be emphasized that the vessel is only floating on the hull - 12 200 tons of buoyancy - and that there is 7 700 tons of reserve buoyancy in the hull above waterline. The Car Deck superstructure will only contribute to residual stability (GZ) in heeled conditions as long as it remains weather tight and GZ>0. The Deck House does not contribute to buoyancy or residual stability (GZ) as it is not weather tight. Slide 27 is correct in as much as the vessel sinks, when the reserve buoyancy is reduced due to hull water inflow (leakages), and disappears from the surface when all reserve buoyancy is consumed.. However, if, e.g. the vessel trims on the stern during sinking (reserve buoyancy aft lost first) and the hull comes under water there and the Car Deck superstructure is flooded, then the vessel sinks immediately with some reserve buoyancy forward still available. In fact only 3000-4000 tons of reserve buoyancy may be lost until the ship suddenly disappears below the surface. Slide 28 is correct and is fully in accordance with slide 23 2nd scenario, i.e. as long as the Car Deck superstructure is not flooded, the angle of heel cannot exceed 12-18°. Later the heel can be 40°+, but in order for that condition to be stable, hull decks 0/1 must be flooded with at least 1000-1500 t of water due to hull leakages. Slide 29 is wrong. The Upper Decks deck house will not provide any support (?) of any kind. Stability equilibrium is only achieved by the hull (decks 0/1) and the Car Deck superstructure, as long as the latter is weather tight. Slide 30 is misleading. 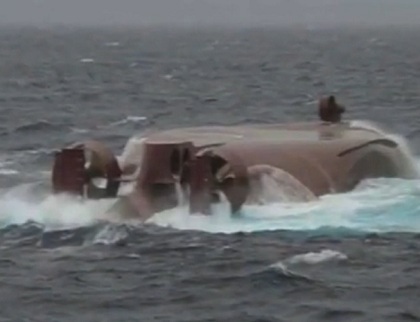 Based on scenario 2 (slide 23) sinking starts, when the hull leakages developed, and the vessel first heels 12-18° due to flooding several hull compartments. When the Car Deck superstructure is submerged and water enters it (e.g. through a partly open aft ramp, open starboard pilot door or any ventilator) the angle of heel will increase >18° and soon reach 40° and later 90°. Equilibrium is always achieved by the hull (decks 0/1). The Upper Deck deck house does not contribute to anything. The deck house is just instantaneously filled with water. Slide 32 - the JAIC scenario - is evidently impossible. GZ becomes negative already at 33-37° heel (it takes less than two minutes according SSPA latest model tests) and the vessel floats upside down and no further loss of buoyancy can take place = no sinking can take place. The figure 2 should be vessel upside down! Slide 34 - Heiwa Co has already provided the SSPA consortium with a chain of events leading to the known processes; (i) hull leakage, probably due to a collision, starting the sinking, (ii) flooding of several hull compartments deck 0/1 causing negative GM and a new equilibrium with 12-18° heel, (iii) flooding of the Car Deck superstructure, when it becomes submerged while sinking, and increased heel to 90°, sinking vessel being in equilibrium all the time. The answer to the first question is therefore available; the hull decks 0/1 was flooded first and the Car deck superstructure later, when it was submerged during the sinking. The answer to the second question is basic; the Upper deck deck house does not contribute with any buoyancy at any time. It is instantaneously flooded as it becomes submerged. The SSPA consortium is kindly requested to consider the above. Slide 11: Detachment of the bow visor. This slide is not clear. MV Estonia sank. Therefore Car Deck, Upper Decks and Decks 0/1 must have flooded. MV Estonia attained heel angle in excess of 40 deg. Therefore, large scale flooding of the Car deck spaces had to take place. MV Estonia floated on her side, Therefore flooding of Upper decks must have been slow, taking place between 13-28 min. - how Estonia floated on her side? - how Estonia sank (Deck 0/1)? The 1st question remaining is: was the Car Deck first to flood and the Decks 0/1 flooded "from above" or were the Decks 0/1 the first to flood and the Car deck flooded "from below"
The 2nd question is: what is the time frame of the loss of buoyancy in the upper decks? The fundamental deficiency of the Final report into the sinking of the 'Estonia' issued 1997 is of course that it does not explain how and why the ferry actually sank as a result of the published proximate causes of accident - defective locks securing the visor protecting the ramp of the forward opening in the superstructure, wave loads, structural damages, ripped open ramp and finally water entering the superstructure! If you, like Heiwa Co, ask that simple question - why sink due to all those fairy tales - the only reply you get is an insult; you are stupid, unintelligent, unreasonable. This is a normal reaction when official people are caught with their pants down lying. Because it is very easy to show that all info about defective locks, wave loads, structural damages, water inside the superstructure, etc., etc. are simple lies. The Commission evidently censored the fact that the ferry floated on its undamaged watertight hull according to the principle of buoyancy of Archimedes developed circa 252 BC and that sinking could only have started, when (or if) the hull started to fill up with water. The Commission never explained - they could not - how the undamaged hull and 14 watertight compartments were filled with water so that the ferry could sink. The now infamous Final report does not mention or investigate watertight integrity, watertight doors, bilge pumps and bilge alarms in the hull preventing sinking and ignore crew statements to the effect that the ship was leaking below waterline and being flooded from below. sinking of the whole ship was then inevitable. Why and how 14 watertight compartments of the undamaged hull - totally 18 000 cubic meters volume - on which the 'Estonia' initially floated with displacement about 12 000 tons and with 6 000 cubic meter of reserve buoyancy and closed watertight doors was water filled is never explained. One major reason to make a new study is actually to clarify this very serious deficiency - how can a heeling moment produced by water inside a superstructure cause an intact ship hull to sink? Naval architects everywhere are also invited to answer the riddle. The members of the Royal Institution of Naval Architects and students of marine accidents have been invited 2002 to explain why the 'Estonia' sank in the official sequence of events of the Commission/Final report as quoted below. Nobody at the RINA has replied (2004). The Swedish National Maritime Administration (Sjöfartsverket) has officially announced that the Final report into the sinking of the 'Estonia' is complete in all respects in spite of it not explaining the inevitable sinking (sic). As a matter of fact the Swedish Director of Safety at Sea, Mr Johan Franson, has explicitly told his expert staff not to look into the matter at all - the floating and sinking of the 'Estonia' cannot be discussed at the Swedish NMA. So much for safety at sea - floating of ships - at the Swedish NMA. The Swedish NMA is not happy that a new study is made 2006-2008! The Swedish government did on 19 April 2001 acknowledge that the Final report does not explain the sinking. However, instead of asking some real experts to clarify the matter, the government decided that the Swedish Board of Psychological Defense, SPF, should provide 'one explanation that, based on the sequence of events of the Final report (sic), describes how the 'Estonia' was filled with water at the end of accident'. This in an interesting task. 'The sequence of events of the Final report' is quoted below. Other sections of the Final report give slightly different descriptions. But how was the hull of the 'Estonia' flooded and filled with water 'at the end of the accident' so that she sank is not described anywhere. (c) the hull of the 'Estonia'. This water filling report is full of new, false assumptions and manipulated calculations that are easy to reveal and is only the latest contribution to the 'Estonia' tragedy and cover-up ordered by the Swedish government. Mr Sjöling never considered the below, basic facts. Why didn't the 'Estonia' capsize and float upside down latest at Events 15 - 23 of the Commission? There are at least 33 'events' according to the Commission/Final report before the sinking (none of them proven!) - events 1-18 are about the list occasioned by alleged very large, increasing amounts of water inside the superstructure on the watertight car deck producing a big heeling moment (the trimming moment is conveniently forgotten) of the intact hull. Why didn't the 'Estonia' trim so that the Water either flowed out (bow trim) or stopped flowing in (stern trim - opening high above water)? Then there are events 19-33 about the flooding of the deck house on top of the superstructure and 8-18 meters above the waterline. There the Commission states - event 30 - that due to flooding of the deck house (sic) - 8-18 meters above the waterline - the watertight compartments of the hull below waterline started to flood from above!? Mr Sjöling was appointed to explain this surprising effect - the watertight compartments of the hull started to flood from above. How? No scientific explanation had been given for eight years why water in the open deck house of the 'Estonia' flooded the hull compartments below the superstructure. It is evidently not possible to explain at all! Event 34 - that the ship inevitably sank - is therefore not explained. Please dear reader, remember, every event must also have a proven cause to produce an effect. In spite of the fact that Mr Sjöling should explain the water filling based on the official sequence of events including flooding from above, Sjöling invents new defects - ventilation ducts in the side - and new phenomena - the vessel floats on the deck house, which is only flooded when one or two doors or a few windows break open - preventing capsize for 35 minutes! on top of the superstructure was the deckhouse (decks 4-8), white in the figure above. The deckhouse was >8 meters above the waterline and neither watertight nor weather tight. Windows were therefore permitted in the deckhouse. Evidently there was no watertight subdivisions in the deckhouse. Evidenty the ship does not float on the deckhouse! damage stability of the 'Estonia' is then provided by the intact (not damaged) watertight compartments of the hull, i.e. two adjacent compartments could be flooded and the 'Estonia' had still enough buoyancy to float on the remaining compartments with the superstructure above water and enough stability to be upright with water on top of the hull (in the superstructure). 2 000-3 000 tons of water in the superstructure would list the 'Estonia' >40 degrees and the water would reach the underside of deck no. 4 six meters above the car deck. An observer at the front of the car deck would have seen the view shown right, if the the ship trimmed even. The condition is not only unstable - all the water would have trimmed the ship on one of the ends. This amount of water is an enormous amount of lose weight - a monster - 18-25% of the total weight/displacement of the ship, and it can only produce one result - instant capsize. Then the ferry turns upside down - the extra water flows out - and the ship floats upside down on the undamaged hull. Never in maritime history has a ship loaded so much water and remained both floating ... and stable! The 'Estonia' was a remarkable ship ... but it is not explained why! Water in the superstructure heels the ship until capsize! capsize occurs, when the residual stability is nil, i.e. when any heeling moment due to weather or (shifting) cargo, e.g. water in the superstructure, exceeds the righting moment of the hull and superstructure; the result is capsize, i.e. the hull and superstructure turning upside down and the vessel floating upside down on the (intact or damaged) hull. The picture right shows a capsized ship floating upside down (the Joola 28 September 2002). The 'Estonia' would have capsized like that with water on the car deck. 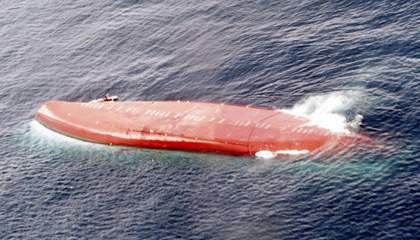 sinking occurs only, when the weight of the ship and cargo exceeds the available buoyancy of the hull and when capsize has not occurred previously. The alleged 'sinking' of the 'Estonia is only described by the Commission in two pages (pp 175) in chapter 13.2.6 and in a couple of pages (pp 181) in chapter 13.6 of the 228 pages Final report, FR. It is only a long description of events about the list (no mention about trim) and a long description of further events of the flooding of the deck house 8-18 meters above waterline but very little about the sinking (why the hull compartments were flooded). There is in fact no evidence for any alleged event - the whole sequence of events is made up from bits and pieces of real or fabricated happenings onboard and false (or incorrect) stability calculations. It means that an alleged event cannot be supported by a valid stability or floatability calculation. Every event is just an invention of the Commission. Thus it is very difficult for Mr. Sjöling to explain the water filling of the hull and the sinking ... but he doesn't complain. The movements (speed, course, position, angle of heel, etc) of the 'Estonia' during the 33 events leading up to the sinking at 0152 hrs are plotted in figure 13.2 of the Final report. It can easily be proven that this plot is a total falsification. It is in fact only a plot of an undamaged ship that turns under engine power and then drifts due to weather and wind (and never sinks). The inventor of the plot has then added alleged angles of list at various times and the Commission has later modified, increased, these alleged angles of list to the plot to make it appear that it is a plot of the 'sinking' 'Estonia' and it then deleted the drifting after 0152 hrs to make it appear that the vessel sank at 0152 hrs. Thus, the alleged events of the Commission are based on a false and manipulated plot! It is a pity that Mr Staffan Sjöling does not understand this and points it out to the SPF! The Final report gives some key times 01.14, 01.24, 01.27, 01.33, 01.42 and 01.52 hrs with certain amounts of water in the superstructure and the deck house and the associated angle of list as per below table. The expert of the Commission, Dr. Michael Huss, FRINA, who made the original plot, had previously suggested other - much smaller - amounts/angles of list in a report to the Commission, which were later modified in the Final report. Huss only calculated the water inflow into the superstructure and the resulting list until capsize (at 01.42 hrs). Trim was not considered. Huss knew that the ship would capsize but cannot admit it. His calculations therefore stop, when 2 000 tons have entered the superstructure. Huss has falsified the inflow rates to delay the capsize. Huss cannot explain how the hull would fill with water. Dr Huss assisted the Commission to falsify the accident investigation. The Commission arbitrarily then suggested that the water inflow (tons/min) into the superstructure was about six to seventeen times larger than suggested by dr Huss. Huss did not protest! The Commission did not provide any stability calculations except a falsification for the event at about 0130-0133 hrs with 18 000 tons (sic) of water in the ship 19-22 minutes before the sinking which allegedly was stable not causing capsize. The 'Estonia' loaded 18 000 tons of water - she had only a deadweight of 3 000 tons - but was still stable - and didn't sink. Sjöling improves on this - he states that even more water can be loaded without causing sinking. Below is a table showing the water inside the vessel at different times - the hull is always dry - according to Huss and the Commission. b"By about 0120 hrs all four main engines had stopped ... The main generators stopped about five minutes later. c"... and the vessel started to sink. At a list of about 80 degrees the bridge was partly flooded. This happened shortly after 0130 hrs as indicated by the clock in the chartroom ... The emergency generator stopped at the same time ..." (Chapter 13.2.6 of (5)) - Events 18 and 31 below. There is no doubt that the Commission manipulated (added to) Huss figures. Thus all alleged events of the Commission are not based on any correct stability calculations - just on arbitrary angles of heel and amounts of water inside the ship. It is a scandal that Mr Sjöling does not discover this. Evidently you must check the validity of the input data. Has Mr Sjöling not heard the expression 'Rubbish in - rubbish out'? 33 False Events (no evidence of any sort!) = Lies - The fairy Tale! The 33 events or statements of the Commission below left are verbally from the Final report with right some comments and references to the book Disaster Investigation! All 'events' are false, misleading or distortions of facts. "On deck 1 the first passengers left their cabins already when they began hearing metallic blows from the bow area. A few have reported seeing small amounts of water in corridors on deck 1 and feeling that the vessel already at this stage had a slight list". There is no evidence that the metallic blows allegedly heard by some passengers on deck 1 originated from the bow area - 2.12 and (33). Actually a few passengers on deck 1 in the hull only heard a couple of bangs (before 0100 hrs) and escaped. There is no evidence of any metallic blows from the bow area. One passenger noted water flowing out from an air pipe on deck 1. "While the ramp was partly open inside the visor, water entered the car deck along the sides of the ramp, as observed first by the third engineer at 0110-0115 hrs on the TV monitor showing the forward part of the car deck". This event is strange - the ramp could not have been partly open inside the visor, as the ramp was pulled fully open when the visor fell off and 'water entering the superstructure' at the leaking ramp is alleged to have occurred two minutes after the sudden list according to the systems engineer (Sillaste) - 1.3. The third engineer (Treu) lied about his escape - 1.48 - and has never stated that he saw water coming in during five minutes before the sudden listing. In fact Mr Treu never observed the sudden listing - according to Treu the ship listed very slowly, 3-4 degrees/minute and it was only after the listing started at 0115 hrs that he allegedly checked the ramp on his monitor. Then he allegedly stayed on 10 minutes down on deck 1 trying to save the ship. This is a lie - Treu never did that! "The water noted by the first passengers fleeing from their cabins on deck 1 could (sic) at this stage have poured down to the accommodation on deck 1". For this 'event' - water pouring down to deck 1 - to be possible water must thus have entered at the ramp, flooded the superstructure up above the sills of the starboard fire doors (25 cms high) in the centreline not causing any list. However - the ship was listing to starboard, so the water 'could' not have poured down from deck 2. It is more likely it came from below - deck 0! "Later, during the evacuation, several passengers observed on deck 2 that water entered the staircase through the slots around the fire doors to the car deck". Later the list had developed, so all alleged water in the superstructure should have been in one starboard corner on deck 2 far away from any fire doors. And apparently nobody observed water flowing down the stairs to deck 1 or 0. The 'event' is not proven. It is an invention by the Commission based on invented testimonies! "After the ramp had been forced open by the visor, waves may (sic) have caused the ramp to move between fully open (sic) and partly closed position but generally a significant opening was available for waves (sic) to enter the car deck as further described in 13.5 below". Waves 'may' not have caused the rampt to move at all. Note that the ramp (16 tons of steel) is alleged to have been moved between fully open, i.e. fully down, and partly closed position, i.e. up, by waves, while the ship was doing 14 knots with a pitching/relative motion amplitude forward of >5 meters. The weight of the ramp itself is not considered. Evidently a 16 tons ramp cannot flip up/down due to wave motion. You would expect the ramp to fall down on the fore peak deck below the waves and act as a plough pushing the water into the superstructure. Then the ramp would twist itself around the bow - 3.11 and Appendix 4. The ramp could not move between fully open and partly closed positions. The 'event' is not proven and is another invention. And with a fully open ramp and full speed and pitching up/down five meters 180 tons of water would have entered the superstructure every six seconds - you would expect the ship to stop and capsize immediately or to go under like a submarine! 2 000-4 000 tons of water to enter the superstructure. "... probably (sic) in one single movement, the visor pulled the ramp forward so that its locking devices and hydraulic actuators failed. The ramp was then free to fall forward towards the uppermost cross-bar of the visor". There is no evidence for this 'probable' 'event'. The ramp locks and hooks are undamaged - 3.10. And the official story is that the the ramp was pulled fully open, when the visor fell of at 0115 hrs. Now it falls into the visor. "... Only during the final phase, when the ramp had been forced partly open, could water, collected in the visor, flow onto the car deck through the openings along the sides of the ramp". The time for this alleged 'event' is 0115 hrs, even if there is no evidence for it. This is all in chapter 13.5 about the ramp and waves (sic - event 5) starting to enter into the superstructure. According to event 3 water had already flowed down to deck 1 before this time. The ramp is now fully open! No list has developed. "The large amounts of water flooding onto the car deck caused the vessel to heel over and after a few rolling movements (sic) a significant list developed to starboard". This alleged 'event' is at 0115-0117 hrs. The result is that all water collects in one starboard corner of the superstructure, the ship lists so that the water cannot flood any compartment of the hull -1.9 and 2.16 through doors in the centreline and that the ship immediately capsizes due to the extra weight in the side - and floats upside down. 'Events' 3 and 4 are not possible. Note that there are no transverse bulkheads inside the superstructure, so the water flows to one corner, where it produces a heeling (and trimming) moment. A 'few rolling movements' cannot have been caused by that water - for that you need a rolling moment! "This happened within the first minutes after the visor had separated from the ship". There is no evidence that the visor separated from the ship. Evidently - water (e.g. 571 tons) in the superstructure causes the ferry to list (e.g. 15 degrees) and to trim (e.g. 0.5 meters on the bow and then the water flows out if the speed is zero). But you would expect that 180 tons would have been scooped up into the superstructure every six seconds or > 1 800 tons in one minute before the speed became zero causing immediate capsize, or that the first wave would have pushed down the bow under water forever. "According to witnesses the ship steadied temporarily at a list angle of about 15 degrees". Actually witnesses stated that the ship first listed >30 degrees, maybe 50 degrees and then uprighted to 15 degrees list - 2.1 - where it was stable. "... At about the time when the list developed, the engines were throttled back close to idling speed and the vessel was turned into the wind as dealt with in section 13.3". There is no evidence for these two alleged separate 'events'. Elsewhere in the Final report it is suggested that the engines were running for another five minutes. Nobody has observed a 180° turn - 1.9. But the Commission suggests elsewhere that the crew both slowed down (but didn't go astern) and turned the vessel fully into the waves - making things worse. "... It is evident (sic) to the Commission that, because of the list and the sound from the (the visor's) collision (with the bulbous bow) the officers on the bridge initiated a reduction of speed and a turn to port". It is not evident that (a) there were any officers on the bridge and (b) that they took the two alleged actions. This is all in chapter 13.3 about the engines were throttled back, etc., and the vessel turned into the wind. Nobody survived from the bridge. Nobody has observed any 180° turn. "... It is the opinion (sic) of the Commission that full service speed setting was maintained right up to the time when the list developed". As the visor is alleged to have fallen off at 0115 hrs and the first list developed until 0117 hrs, the speed 14/15 knots was maintained for two minutes. Actually full service speed was >19 knots. 3/E Treu (event 2) and his colleagues in the engine control room have not testified about engines being throttled back. "During the port turn water continued to enter the car deck (i.e. into the superstructure) and the list increased to 20-30 degrees where the vessel for some minutes (sic) stabilised as the water inflow decreased (sic)". These events are at about 0116-0120 hrs. Nobody has observed the 180° turn. The second period of stabilisation 'for some minutes' is not mentioned anywhere else in the Final report. Compare 1.9. When took this 'event' place? Why and when would the inflow decrease during (0116-0120 hrs) or after the turn (0120 hrs)? According to the Final Report the list was 15 degrees at 0116 hrs, 30 degrees at 0120 hrs and 40 degrees at 0124 hrs. You need 571, 1 500 respectively >2 000 tons of water in the superstructure to heel as stated (ignoring trim) and a steady inflow of about 200 t/min. If the inflow decreased, why did it decrease (they were steaming straight into the waves at this time!) and why increase later? "By about 0120 hrs (sic) all four main engines had stopped ... The main generators stopped about five minutes later. After the main engines stopped, the 'Estonia' drifted with a list of about 40 degrees and the starboard side towards the waves". This event is at about 0120-0125 hrs. The vessel has stopped with the bow away from the waves and you would expect that all water in the superstructure would flow out by itself as soon as the vessel stopped. However, according to the Commission no water flows out ... but more water flows in, which is very strange! The condition - 'event' - with 40 degrees list was also unstable - 1.9 and 2.16. That the 'Estonia' drifted is not proven. How can a sinking ship drift with 2,2 knots sideways? Assisting ships saw the 'Estonia' immobile in the water at this time and that she sank soon after. But now there was another 30 minutes of drifting before the ship had sunk. "Water continued to enter the car deck (i.e. the superstructure) through the bow but at a significantly lower rate (sic)". We are again told that the inflow into the superstructure decreased, but it is not possible, because the list increased rapidly indicating a bigger heeling moment of water in the superstructure (a bigger inflow 666 t/min). At this time the bow was allegedly turned away from the waves so the water should have flown out (when the vessel floated on the deck house). Actually the ferry should have been floating upside down at this time - capsize! Note that there is no mention about the vessel trimming due to the inflow water! "Waves were pounding against the windows on deck 4. Window panels and aft doors broke, allowing flooding of the accommodation to start". It is correct that the deck house (deck 4) came under water at this angle of list (40 degrees). The deck house is neither water- nor weather tight. the vessel started to sink". Trim by the stern? How was that possible? The water was only extra cargo loaded on the car deck in the superstructure - but why would the ship with an undamaged hull start to sink ... and trim! ... due to that? Why hadn't she trimmed from the start? Was the ship overloaded? Yes, of course, with > 2 000 tons water inside the superstructure - and she should have capsized - not sunk due to it! So now will we finally know how and why the ship sank, i.e. how the buoyancy in the hull was lost ... or? "... the vessel started to sink. At a list of about 80 degrees the bridge (sic) was partly flooded. This happened shortly after 0130 hrs as indicated by the clock in the chartroom ... The emergency generator stopped at the same time ..."
So the vessel started to sink after 0130 hrs - what it was doing prior to events 18 - 19 was only listing - and floating ... but not trimming due to water loaded in the superstructure. Suddenly the list was 80 degrees - a completely unstable condition/'event' - how was it reached shortly after 0130 hrs we do not know. At 0124 hrs the list was only 40 degrees (event 15) without trim. Note that the bridge (deck 9) was alleged to be flooded - but then the trim must have been on the bow. But in event 31 below decks 7 and 8 of the deck house (sic) were not flooded - they were a 'stability reserve' - see event 22. And if the ship was trimming on the stern the bridge would have been above water. How could the clock on the bridge stop at 0135 hrs, unless the ship had already sunk then? "... The sinking continued, stern first and the vessel disappeared from the surface of the sea at about 0150 hrs". So the sinking 'event' took place for 20 minutes between 0130 and 0150 hrs? But how did it take place? How was the buoyancy in the hull lost? How could water fill the hull? What happened to the testimonies from the 'Mariella' that the ship disappeared already 0136 hrs? "This phase of the accident (i.e. the sinking) is covered further in 13.6". Aha - we have to look into yet another chapter in the Final report for this 'event' - sinking - the hull being filled with water - to be clarified! The end of the accident is still not reached. But first a description how the deck house was filled with water. "... Because of the list, waves reached up to the accommodation decks (i.e. decks 4-8), breaking doors and windows. The interior started to flood and the stability reserve (sic) disappeared". Here is a strange statement - the stability reserve disappeared - in the deck house? What 'event' was that? There is no stability reserve in a deck house, which is not weathertight. The stability of the ship is only provided by the hull (and by the intact superstructure, if it is tight. But in this case the superstructure was open to the sea and full of water and did not contribute to any stability - it was full of water listing the ship). Strangely (sic) enough there are no correct stability calculations in the Final report (or in Mr Sjöling's study). On the other hand there are numerous false stability calculations in the Final report by Finnish and Swedish professors and 'experts', which Mr Sjöling expands on. Mr Sjöling proves here that he is 100% incompetent - he cannot understand that the stability calculations of the Commission are false. "The first potential openings (sic) to be submerged were the aft windows on deck 4. In calm water (sic) this would happen when about 2 000 tons of water ... had entered the car deck (sic - the superstructure) and caused a heel angle of about 40 degrees". This is a repetition of event 15 at 0124 hrs. But one statement is correct - 2 000 tons of water loaded as extra cargo in the superstructure would have caused a list of 40 degrees - in calm water (assuming no trim). What was the righting lever GZ at this angle of heel? Answer is 0. What happens when GZ = 0? The ship capsizes! What is the heeling moment of 2 000 tons? Answer it is exactly equivalent to the maximum righting moment of the intact hull. Thus the remaining righting moment is zero = capsize. In what direction trimmed the ship due to 2 000 tons - bow or stern? Actually the first 'opening' to be submerged was either the bow opening in the superstructure itself , or, if the ship trimmed on the stern, the aft ventilators to the superstructure, with the bow several meters above water (and away from the waves). "... The first windows broke probably a little after the main engines had stopped and when the vessel was drifting with her starboard side to the waves". This is a repetition of event 15. Is this relevant? Does a ship float on windows on deck 4? Why doesn't the ship capsize? Mr Sjöling has no idea! He thinks the vessel floats on the deckhouse. "Quickly submerged were also the aft windows on deck 5. This happened at a list of about 50 degrees ..."
Or this? Windows on deck 5. Does the ship float on those? Why doesn't she capsize? The time is 0127 hrs. "... When some of the large windows on decks 4 and 5 broke, these decks became subject to progressive flooding and no buoyancy (sic) or stability (sic) contribution (sic) was available from this part of the superstructure (sic)". This is very strange - the deck house (decks 4 and 5) is regarded as a superstructure. The real superstructure was of course decks 2 and 3 (the car decks), which were already flooded. But it is of course correct that large (or small) windows (sic) of the deck house does not contribute to buoyancy or stability - this is basic naval architecture. The ship does not float on the deck house windows! Windows are evidently not permitted in a superstructure. This is a 100% incorrect statement. The 'accommodation spaces' are the deck house, but it is not the flooding of a deck house that sinks a ship - it is the flooding of watertight compartments of the hull! Flooding of a deck house leads to capsize! Interesting statement - 'or the condition could no longer remain stable'! Exactly - this is it - the 'Estonia' should have capsized and floated upside down on the undamaged hull, when the deck house came under water at 0125 hrs - actually, when the righting arm GZ was 0 at 40 degrees list! But in event 31 below the ship is stable! And she is stable and floating for another 30 minutes. ... as there were connections between different decks via staircases and other openings. Totally unclear and another 100% incorrect statement.! Did the ship sink or did the condition become unstable as there were staircases and other openings connecting decks in the deck house? But the deck house was flooded because the windows were broken. No mention of any ventilation ducts in the side to cause flooding of the hull. They are invented later - by Sjöling 2003. The text left was written 1997. "The watertight compartments below the car deck were thus flooded from above".
? Completely unclear and impossible - thus another 100% false statement! If the 14 watertight compartments on decks 0-1 below the car deck - the hull - were not flooded, when the superstructure decks 2-3 was flooded, it will not take place at any later stage, when the angle of heel is greater and when decks 4 and 5 are flooded. Water in the deck house decks 4-9 should evidently first flow down into the superstructure decks 2-3! This event is complete nonsense. It is nonsense because the Commission censors the simple fact that capsize takes place much earlier. "... 18 000 tons of water onboard, distributed between the car deck and decks 4 and 5 (sic) would have given a heel angle of about 75 degrees ..."
?? Another 100% false statement based on available falsified stability calculations! With 18 000 tons of water onboard, the vessel would have sunk like a stone - there were only 6 000 m3 of reserve buoyancy in the hull. But you only needed 2 000 tons loaded on the car deck in the superstructure to make her capsize and float upside down on the hull long before this event 31. And why were water not distributed in the deck house decks 6, 7, 8 and 9? The bridge - deck 9 - was flooded already shortly after 0130 hrs, when the clock stopped - event 19! Actually the 'stability experts' of the Commission - see below - apparently assumed that there were 4 000 tons of water in the 'superstructure', 14 000 tons of water in the 'deck house' (decks 4 and 5) and that decks 6, 7 and 8 were completely watertight providing at least 18 000 tons of extra buoyancy that evidently does not exist! The statement ('event 31') is complete nonsense. "It can be concluded (sic) that, although the vessel fulfilled the SOLAS damage (sic) stability requirements ..., she had no possibilities to withstand progressive flooding through the superstructure (sic, i.e. deck house) openings once the heel angle approached 40 degrees." This is nonsense - progressive flooding through the superstructure at heel angle 40 degrees ??? Strange conclusion - who has ever heard of progressive flooding of a 7,6 meters deep hull through the deck house openings (sic) situated >6-10 meters above the hull - via a flooded superstructure? Water could never flow down into the hull of the 'Estonia from above! SOLAS damage requirements are only about side collision damage (structure ripped apart) to the hull starting at the keel upwards without limit, where the hull is flooded from outside/below waterline first - one or two compartments. The hull shall then still float with the superstructure above water. The deck house is evidently not considered at all! Why not simply say that the vessel would have capsized and floated upside down, when the heel angle approached 40 degrees due to water collected inside the superstructure above waterline? The righting arm GZ was then zero! See events 23 and 28 above. No flooding of the hull will or can ever take place. The conclusion in event 32 is nonsense. In addition it is not proven that the vessel fulfilled the SOLAS damage stability requirements. The hull had 22 watertight doors, which was against the SOLAS requirements - 1.23. ???? Strange statement ('event') - ships do not sink because windows in the deck house are broken! Ships do not float on windows. It is not inevitable that ship sinks when a window is broken. The only purpose of the windows were to protect the passengers from wind, rain, cold and weather and to provide light and a view of the sea. This is one of the most stupid statements in the whole Final report - sinking is inevitable when windows in the non-watertight deck house were broken! But it is part of the official sequence of events. Event as per the Commission - 13.6 in FR - ... and the sinking of the vessel. So now we will be told how the vessel inevitably sank.
" ... sinking was inevitable". Why was it inevitable? There is no explanation in the Final report why and how the ship sank! Except that the windows in the deck house were broken. Had the windows not broken, then the vessel would have floated according to the Commission and its stability experts. You wonder what monkeys have concluded events 1-34 left above? It is not a serious accident investigation! The above 33 'events' are the alleged 'scientific' explanations by the Commission after 38 months of secret deliberations, why the 'Estonia' sank in 37 or 20 minutes, i.e. how 14 watertight compartments in the hull were flooded and 12 000 m3 of buoyancy and 6.000 m3 of reserve buoyancy in the hull were lost. But the latter - event 34, the inevitable sinking - is never explained. The conclusion that a ship sinks due to windows breaking in a deck house 8-12 meters above waterline is of course ridiculous - but it is the official explanation for the biggest maritime accident in the Baltic since 1945. You wonder what clown wrote this? And why not one Estonian, Finnish or Swedish expert has queried it! Except the undersigned (who is based in Egypt and France). Anyway, Mr. Staffan Sjöling of the Swedish Defense Board of Equipment accepted in September 2002 to explain in 60 hours how to describe the sinking. And Mr Sjöling accepted all above 33 events as truth! Mr Sjöling has then proven himself incompetent. We are in fact not very interested in the various 'events' when the ship was still floating, we are only interested why the 'Estonia' sank according to the principle of Archimedes. water in the deckhouse does not affect the damage stability and buoyancy of the ship hull and superstructure; it is not part of the ship from damage stability and buoyancy aspect. Flooding of a deckhouse is irrelevant, when describing the sinking of a ship. Events 19-33 are about water in the deckhouse causing a ship to sink. Everybody (including Mr Sjöling) should know that a ship does not float on a deckhouse or its windows (it is always high up in the air) but the Commission made up 15 events to explain that water in a deckhouse with broken windows causes sinking of the hull. It is to say the least unsatisfactory. An even more obvious and serious question was never replied to in the Final report - why didn't the 'Estonia' capsize and float upside down when the superstructure was flooded? Doesn't the principle of Archimedes apply at every alleged 'event'? All 'Events' are false - the whole Story is one Fairy Tale - 100's of lies!! It is sad to conclude that all 33 'events' above are false - the listing (events 1 - 18) cannot have been caused by water in the superstructure and the flooding of the deck house (event 19 - 33) with broken windows is irrelevant and cannot have caused the sinking - the flooding of the watertight hull below the superstructure and associated loss of buoyancy. It is even sadder to note that Mr Sjöling in 2002-2003 expands on the broken windows deckhouse doors theory - he assumes that the deckhouse is watertight and allows small amounts of water to enter the deck house through selected windows and doors, while at the same time the ship floats on the deck house. This is not incompetence - it is unscientific and in the circumstances ... criminal. Sjöling assists to clean up after the cover up. If the ramp had been fully open when the ship was making 14/15 knots and pitching up/down five meters every six seconds, as alleged by the Commission, the ship should simply have capsized in the first minute - each wave entering the superstructure (every six second) would have added 180 tons of water into the superstructure. Any other story with an open ramp, speed forward and big pitching is a fairy tale. Mr Sjöling does not agree ... he believes the vessel floats on unbroken windows. Why did the Commission make up the false Story of 33 different Events, none of which is true? Who wrote the fairy tale in the Final report? It seems to have been written by persons with some knowledge of ship and stability and it should be clear that these persons are fully aware that they are making it up? Evidently the story does not tally fully with the official plot of the accident. Why did the Commission publish a false plot of the accident based on a plot of an undamaged ship? Why did the Commission then try to make up 33 events to fit the plot? And why didn't Mr Sjöling react when he wrote his report? What kind of 'Stability Experts' did the Commission use? The stability experts were, i.a. dr. Michael Huss, FRINA, professor Olle Rutgersson, FRINA and member of RINA Safety Committee, captains Hans Rosengren, Olle Noord and Sten Anderson, Sweden, mr Tuomi Karppinen (head of Finnish Bord of Accident Investigations since 2002), Anti Rantanen and Veli-Matti Junnila and professor Jerzy Matusiak, Finland and professor Heino Levald of Estonia, none of whom have questioned the info on this page - they all refuse to answer. Rutgersson, FRINA, is back in action again 2006 to assist the latest government study. Rutgersson is infamous in Sweden for having received millions is research grants from Swedish government agency Vinnova 2000-2006 without producing any results at all. Rutgersson is one of these useful idiots always telling the media that the government and JAIC and the JAIC Final report are fantastic but that you can always improve. The result - Vinnova is giving Rutgersson SEK1 000 000's to carry out research of better safety at sea. The sad thing is that Rutgersson has not produced any results for better safety at sea at all for the last 15 years. The writer has in fact met dr Michael Huss (August 1997) and asked him to explain the stability during the sinking. Dr Huss refused but was kind enough to accuse the writer of being conspiratorial before he (Huss) hysterically left the room in anger with Rutgersson looking on. Dr Huss is today the head of the ship department of the Swedish Maritime Administration in charge of stability, etc. It seems that dr Huss is looking for new staff to help him falsifying more stability calculations - the NMA is looking for new staff - call in Sweden (+46) Mikael Huss 011-19 18 12, Göran Liljeström 011-19 13 29, Tina Hjort 011-19 14 46 for more info. (It seems Huss asked for and got early retirement in 2006). And how comes that no serious naval architects except Heiwa Co have questioned the fairy tales of the Commission for seven years? (Or twelve years - this article is up-dated in 2006) A new investigation should give the answer. All new facts are, as stated above, to be collected and analyzed by the Swedish Board of Psychological Defense, SPF, which has, as stated, been given the job on 19 April 2001 by the Swedish government to explain why the 'Estonia' sank (was filled with water at the end of the accident'). That job should have been completed early 2002, but on 3 March 2002 the SPF had not even started looking into the matter. It is an impossible task because the Final report is a falsification. On 30 September 2002 the SPF appointed, as stated above, naval architect Staffan Sjöling to have a go. On 31 December 2002 Mr Sjöling could not provide any method to prove sinking based on the official events. But on 28 March he produced a report - another criminal manipulation of the 'Estonia' tragedy. Yes, it is criminal to write such a report - to assist cover up serious mistakes of the Commission. Heiwa Co suggests since 1994 that the 'Estonia' sank due a simple leak of the hull below the waterline. The Commission never investigated the possibility. According to the Commission the hull is undamaged and there is no leak (but neither the Commission nor Mr Sjöling has evidently not provided any evidence to this effect). Maybe the reason is that 12 extra Estonians survived - and disappeared? Heiwa Co suggests since 2002 that the Swedish government ordered the removal of the visor under water after the accident to assist the Commission to produce a false investigation report. Explosives were used and a big hole made in the superstructure. Heiwa Co encourages 2004 the Estonian people to demand a completely new investigation into the sinking of the 'Estonia' 1994. On 17 March 2005 the Swedish government announced that SEK 8 million should be used in a research project to explain the impossible sinking. The project starts 1 February 2006 and is controlled by Vinnova. The project will end 15 September 2008. It will be interesting to see if the 'scientists' can confirm any JAIC facts in that time. And more interesting - how will the scientists announce that all JAIC 'facts' are outrageous LIES to cover up the real cause of the MV Estonia sinking? Subject matter has been raised and investigated. Professor Jim McDonald, FREng FRSE FIET FInstP, Principal and Vice Chancellor of Strathclyde University have been investigating for several months! It seems fraud is permitted. The Naval Architect, journal of the Royal Institution of Naval Architects in London writes on pp 28-42 in the September 2010 issue about the Estonia accident and quotes the info of Heiwa Co that has been censored by the authorities since 1994 - the defective watertight doors.